Soccer is one of the world's most popular sports, with millions of players at every level from youth to professional. Mastering the game takes years of training and practice, with players of high skill levels earning opportunities to compete at the high school, college and professional levels. Improvement over the course of one week is difficult. However, you can make progress — particularly in fundamental areas that provide the framework for future success. Run constantly for each of your first six training days. Alternate training for endurance -- which will take you through the course of 90 minutes of competition -- and short bursts of speed. Three days of running three miles or more, along with sprints on the other three days and a day of rest, should do it. Control the soccer ball while running up and down the pitch. Known as dribbling, this skill set is very important if you are not to be a turnover machine. Become comfortable with the ball at your feet while moving up and down the field by practicing. Increase your power by practicing your penalty kicks. 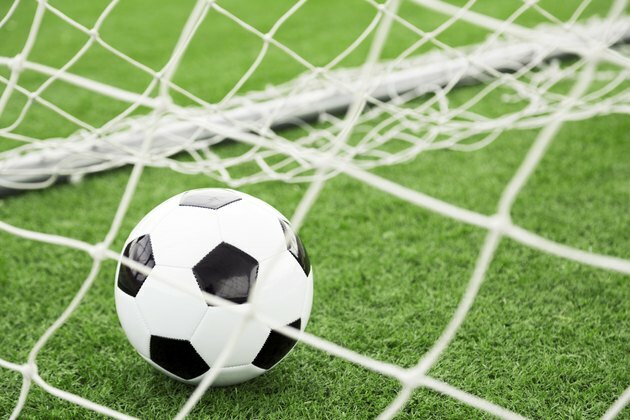 Players who score frequently on penalty kicks can be an asset for any soccer program. Take 50 practice kicks each day, working on making contact with the ball on the inside of your foot and driving it toward your target. Pass the soccer ball back and forth repeatedly with a partner, and learn to hit your partner in stride while running down the field. This is known as a through ball, and is crucial in creating scoring chances. Chip the ball up in the air to your partner, learning to lob it high over defenders into tight spaces. This skill can be developed in a relatively short time and is essential to helping your game to the next level. Study the fundamentals of team defense, like clearing the ball and marking your man, and incorporate those facets into your own game. This study — which you can do by watching soccer in person or on television, or on websites with many hours of soccer video such as footytube — will render you a "student of the game," a trait that all coaches seek in exceptional players. Practicing with a partner -- or better yet, a team -- allows you to have fun and test your skills against other players with similar goals. Focus your practice sessions on the fundamentals to ensure maximum productivity.